Usually I’m pretty good at picking paint but this time I goofed. 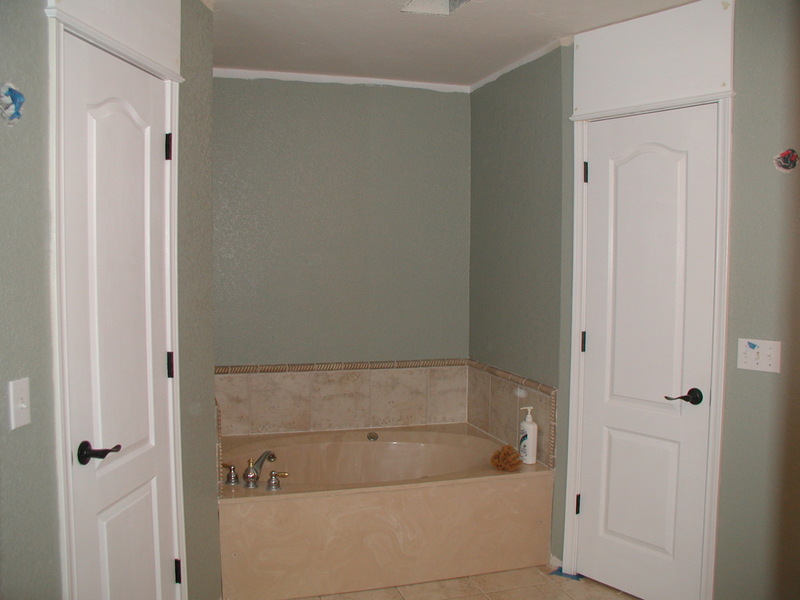 I originally planned on using Lowes’ Waverly Tawny Green WV36007 on the master bathroom walls. I’ve been very pleased with Waverly’s Nordic Blue WV37007 (changes colors in different lights and isn’t so “baby” blue but a little cooler) but this green just didn’t do it for me. Probably this would be fine in a baby room or somewhere you wanted to go soft and pastel-y but I wanted a strong, green-gray in the master bathroom and after a week of living with a test patch, I gave it the thumbs down. Instead I’ve gone with Sherwin Williams SW Escape Gray #6185 (this is in their HGTV line) and I LOVE IT! This is a dark gray-green color which makes the moulding really pop out and brings out the gray tone in the mosiac tile we had picked for the backsplash. The weekend was spent painting – painting walls, trim, doors and more. I’ve got some more touchups to do but here are some rough photos too share; the photos were taken with a flash at night. See the before paint photos here… BTW the wall paint doesn’t go all the way up to the ceiling as we are putting in crown moulding. Because the room has a lot of natural light and white moulding/doors, this darker color works. I don’t know that I would put it in a bathroom with no windows though. The point is if a color isn’t working for you, don’t hesitate to ditch it. You’ll regret painting an entire room and then saying yuck so if your test area isn’t wowing you, re-group and go with another color. Paint is generally the cheapest thing you will do in a room so feel free to change it.